My friend Amber knows shopping. She knows shopping in a way that only a woman can know shopping. She knows vintage, trendy, boutique, thrift. She knows shopping in a rails-of-clothes-and-stacks-of-shoes kind of way. The kind of way that means she will never have a closet large enough. 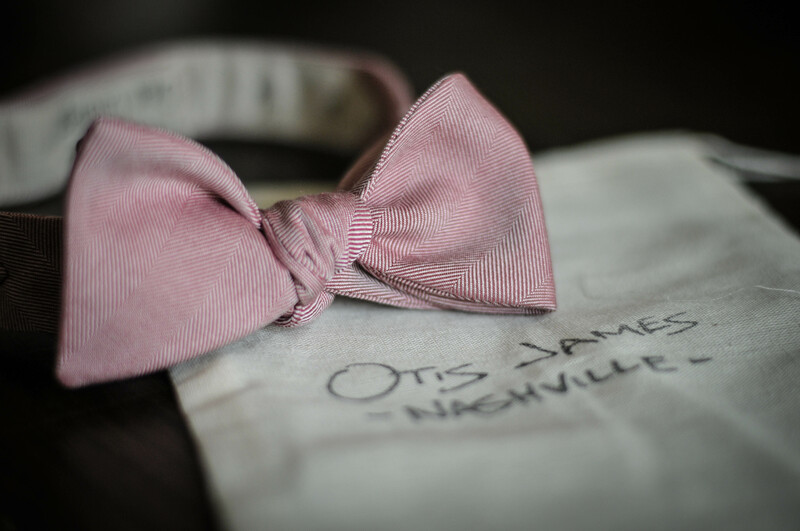 Therefore, when I arrived in Nashville, TN a couple of days ago she was the only person I was going to talk to about acquiring a bow-tie and as usual her advice was faultless. 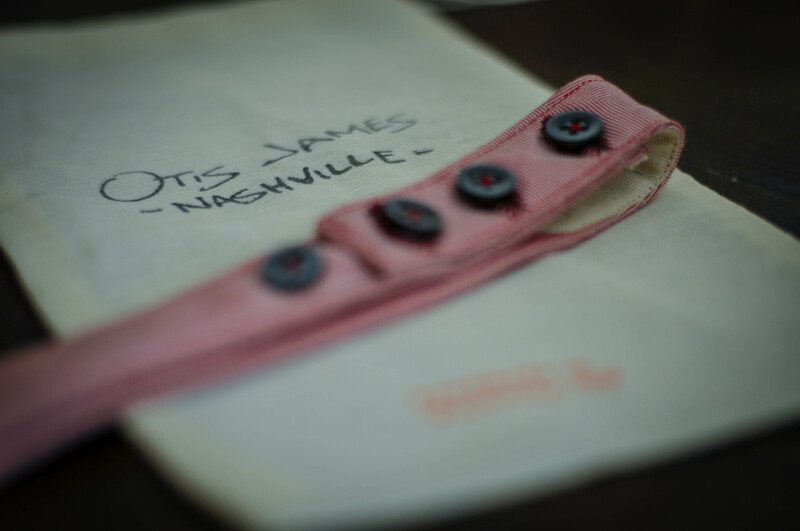 She had seen Otis James’ products in local press and in a boutique nearby where she lives. Wait. Products is not the right word. 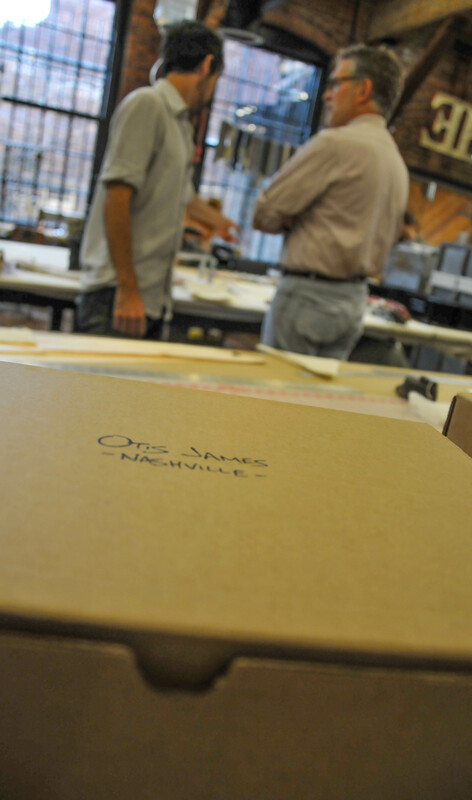 You cannot call Otis James‘ work, ‘products’. It implies that they are somehow manufactured or assembled in some soulless factory in some nameless city in some far-flung place when, in actual fact, they are much more than that. I had the pleasure to visit his studio in the Marathon Motor Works today and was completely surprised. It was not easy to find, tucked inside an old converted car factory on the edge of Nashville but it was worth the hunt. I expected to find some kind of store or shop front but, upon entering, you walk straight into his studio and are greeted by Otis himself. “Hey, how you doing? I’m Otis, what can I do for you?” He said with a friendly smile. I was actually a little disappointed at first as it appeared that he did not have much in stock. 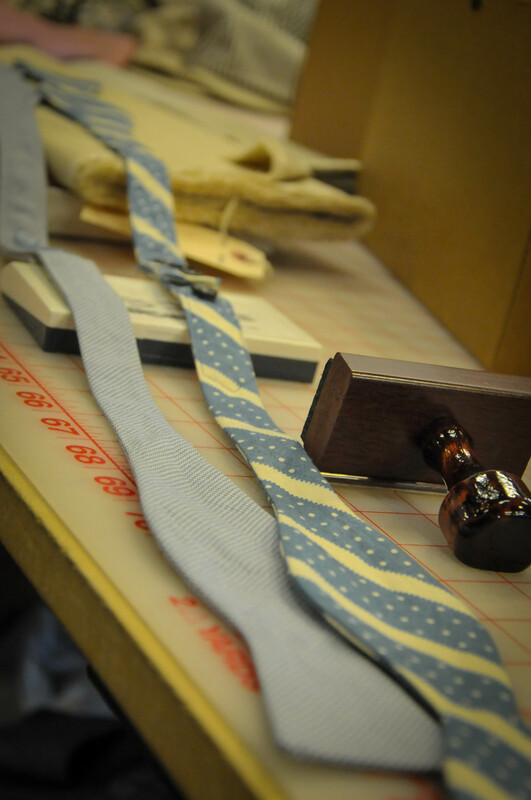 There were a few bow-ties hanging on a wooden rail and a couple of neckties but being so used to buying clothes off the peg with endless options of size and colour right in front of me in every department store I have ever been in, I found myself looking around to find more. I explained to Otis what I was looking for and then we rounded the corner into the main part of the studio and he dived into his rack of materials and before I knew it there were four or five samples of fabric in front of me to choose from. Then it sunk in, of course there were not rails and rails of ties hanging everywhere. 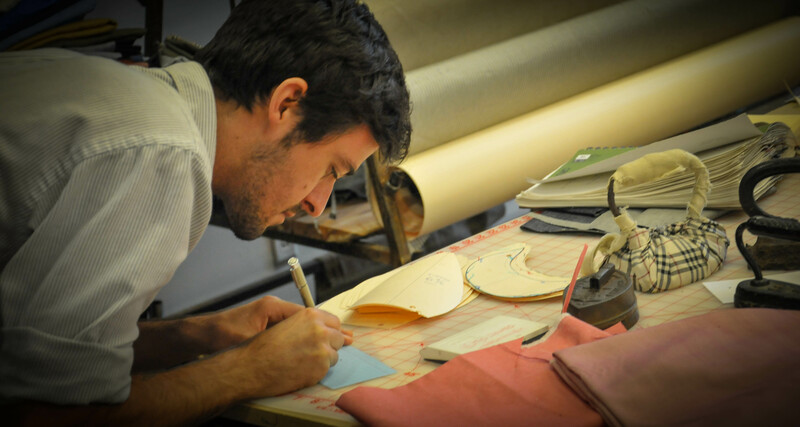 This was no off-the-peg operation, these were bespoke, handmade garments. 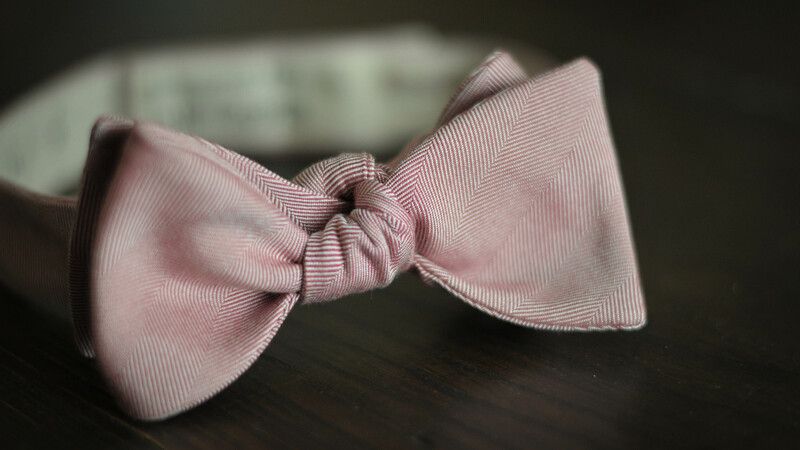 I was able to choose the colour and the kind of material (a salmon, herring bone silk) and the style and size of the bow (classic, straight or pointed, I went for classic). When I told him I needed it by Saturday, just two days hence, I was expecting him to say that it might not be possible or that it would be tight but straight away he said, “It’s ok, I can have that ready for you by tomorrow.” Fantastic. 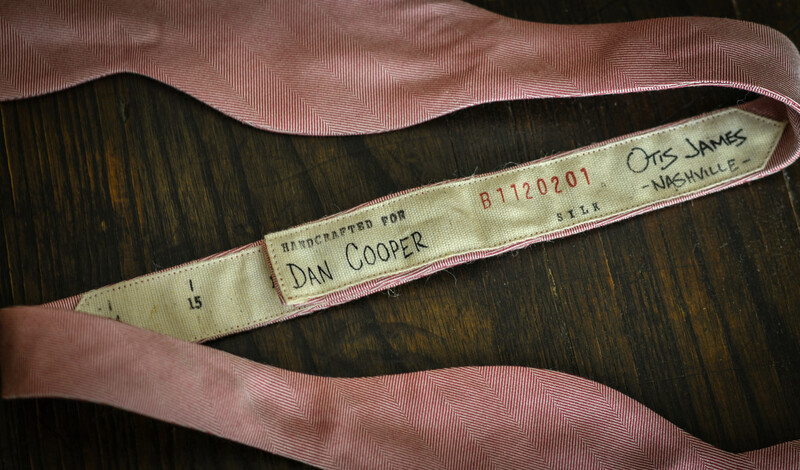 Right from the start I could tell that he has a passion for neckties and bow-ties like nobody I have ever met. He enthusiastically advised me on the colours that would go with my suit and the style that might look best and all with the hugest smile on his face. This is a man who enjoys his job and just by looking at the finished articles you could see the care and skill that went into making them. I am so glad that I get to support this small business. I could have easily gone to a menswear store and bought a bow-tie off the peg that would have looked pretty good but having gotten to see where these ties are made and the passion of the people who make them, the extra few dollars spent on having somebody make it specifically for me (and, incidentally, it will say that on the tie itself!) are completely worth it.